Hair fall is a problem that makes you anxious. We all wish to have healthy and beautiful hair. But all are not gifted with healthy hair. Sometimes it may be so serious that even baldness is caused. Losing about 100 strands of hair is normal. 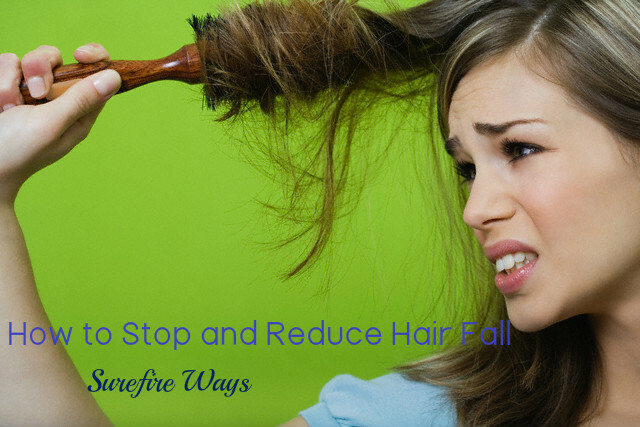 If the number increases beyond that, it is time that you look for remedies to reduce hair fall. Hair fall is caused due to various reasons like improper diet, use of hair colors containing chemicals and hairstyle treatments, lack of nutrients, hormonal changes, stress, dandruff and other scalp problems, and certain medications. If your hair is tangled, use a wide-toothed brush and detangle your hair. Then you can use a fine-toothed brush to style your hair. When your hair is wet, do not comb your hair as it can cause hair breakage and hair fall. So, comb when it is dry or at least semi-dry. After you wash your hair, do not rub your hair roughly with your towel. This can also lead to hair fall and hair breakage. Use a soft towel and let it absorb the moisture in your hair. Make sure to clean your comb every week as it tends to get dirty with use. This is important to check hair fall. Massage your scalp and hair with hot oil once a week. This can greatly help in controlling hair fall. You may use natural oils like coconut oil, olive oil, jojoba oil, canola oil, sesame oil etc for your hair. A hot oil massage helps in keeping your hair well moisturized and well nourished, thus preventing hair fall. Choose shampoos that are free from silicone, sulphates and paraben as these chemicals can make your hair brittle and lead to breaking of hair. Hair fall also occurs when your scalp is dirty. So wash your hair about three times a week with a mild natural shampoo to remove the dust, dirt, bacteria and oil that have collected on your scalp. Some of the hair styles that pull back your hair tightly, like tight pony tail, pigtails etc can cause hair fall. Using too much of chemicals on your hair, blow-drying your hair, ironing and coloring etc are not good for your hair. This leads to hair fall. Juice made from natural ingredients help you to control hair fall. Onion juice is a good remedy for preventing hair fall. It also increases the growth of hair. Have a healthy and balanced diet to prevent hair fall. Foods rich in iron, Vitamins A, C, B complex, and E, omega 3 fatty acids, zinc and proteins help in making your hair grow thick and strong, and also keep your hair and scalp well moisturized. As a result, you will have less split ends in your hair and the hair will grow well. Include food items like yogurt, carrots, brown rice, whole grains, citrus fruits, green leafy vegetables, nuts, pumpkin seeds, fish like salmon and tuna, oysters, eggs, beans, low-fat cheese etc in your diet. Make sure that you drink lots of water. This will remove all harmful toxins from your body. This is a mask that helps in preventing thinning of hair and hair fall issues. Make strong green tea and add 2 tablespoons of this tea to an egg yolk in a bowl. Mix well till you get a frothy and creamy consistency. If it is thick, you can add some more tea. Now apply this hair mask on your hair and cover it with a shower cap. Wait for 30 minutes and then wash with water, followed by shampoo and conditioner. Green tea is rich in antioxidants and helps in preventing hair fall, and at the same time increases hair growth. Egg is laden with proteins and vitamins and hence excellent for providing you beautiful hair. Using this mask three times a week will help you treat brittle, dry and damaged hair and prevents hair fall problems. Use a good brand of oil for making the hair mask. Mix the almond, coconut and captor oil well. Now add stimulate and lavender oil to the mixture. Split the Vitamin E capsules and add them to the mixture. Mix all the ingredients well and store in a bottle in a dry place away from the sunlight. Take a little of this mixture in your hands and apply on your scalp and hair, and massage well. Leave it overnight and then you can wash your hair in the morning with a mild shampoo. Hair spa is a good treatment for preventing hair fall and to enhance hair growth. It conditions your hair deeply and treats split ends as well as dry, damaged and dull hair. It is also good for removing dandruff, which is one of the main causes for hair fall. A good hair spa nourishes the hair roots and fortifies the hair follicles and also revitalizes the scalp. As a result, new hair starts growing. Hair spa also helps in preventing scalp aging and increases blood circulation in the scalp. This leads to a healthy hair growth. You get relief from stress and tension after a good hair spa. So, go for hair spa once or twice in a month and this will provide you beautiful and healthy hair. Other ways to prevent hair fall are laser therapy, medications like monoxidil and use of anti-hair fall products like Trichup Hair fall Control oil, Dove hair fall rescue treatment, Parachute advanced scalp therapie, TRESsemme hairfall defense shampoo and so on. You can also consult hair care experts and take their advice for treating your hair and preventing hair fall. Nice post! After application of egg on hair will my hair have that awful smell?